For immediate attention for medical emergency, call 911. 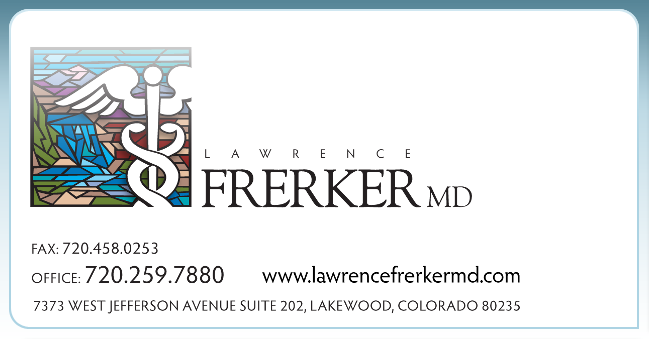 Welcome to Lawrence J. Frerker, M.D., P.C. After 25 years of practicing medicine in partnership with medical groups, Dr. Frerker developed his own practice to improve the healthcare experience for his patients. All patients are welcome, previous and new alike, insurance or self-pay. Dr Frerker and his staff provide a personalized approach to patients' medical needs, respect their time by providing same day appointments whenever possible, and ensure they see the same physician at each visit. Dr. Frerker believes getting to know each patient and establishing a long-term relationship is an important ingredient of quality care. Dr. Frerker focuses extensively on clinical advancements yet his most outstanding characteristic is his ability to communicate with patients. His straightforward and approachable personality helps patients feel at home. Join Dr Frerker for an integrated approach to individual and family healthcare. Dr. Lawrence Frerker, M.D. FAAFP is a board certified family physician and the owner of his practice in Lakewood, Colorado, and has proudly served the local community for over twenty-five years. Along with his staff, he is happy to have had the honor of serving so many wonderful families and individuals, and treasures the long-term relationships they have established. Dr Frerker believes patients can experience improved longevity, wellness, and quality of life through lifestyle modification including diet, weight loss and exercise. He equips his patients to make better food choices based on carbohydrate content, glycemic index and low carb, by expanding their awareness of the science of carbohydrate and fat metabolism, insulin resistance, inflammation and chronic metabolic disease.